A single reusable cloth pad, suitable for heavy flow. With each pad sold a pad is donated to a women in need. A reusable cloth pad suitable for heavyŒæflow days. Buy one give one. 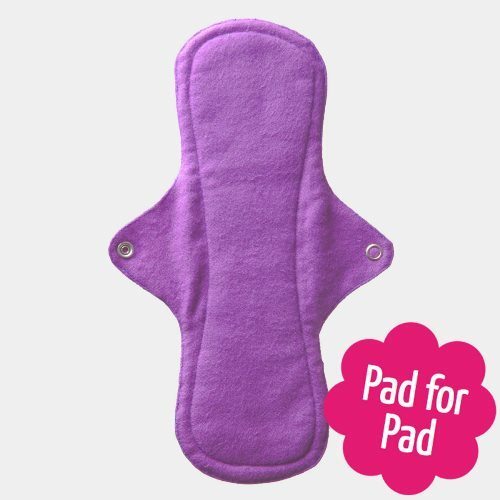 For each pad sold a pad is donated via the Eco Femme Pad for Pad program to a needy Indian girl who otherwise would be going without. Each pack comes packaged with full instructions, and all packaging is recycled. Backing: a breathable layer of colourful co-ordinating cotton printed fabric. Eco Femme is a global women's empowerment project, promoting menstrual practices that are healthy, dignified, affordable and eco-positive. Rural Indian womens collectives stitch these pads, which are then ethically traded - available to Indian women at cost price to be affordable, and sold internationally to help sustain and fund the project. By choosing Eco Femme products, you are supporting this valuable and worthwhile project. In addition, for pad sold, a pad is donated via the Eco Femme Pad for Pad program to a needy Indian girl who otherwise would be going without. The pads may shrink slightly after pre-washing them, the sizes quoted are after washing, so your new pads may appear slightly bigger. Very pretty. Comfortable, very light not bulky at all. No leaks and washed well. Quick rinse and then 30° wash. Fully recyclable packaging. Will buy more.